The offense picked up starter Henry Owens in his first tough outing of the season as Portland knocked off the Binghamton Mets (NYM), 9-4. Owens entered the night without having allowed a run through 12 2/3 innings in his first two starts en route to winning the Eastern League Pitcher of the Week. He cruised through the first two innings, retiring six of the first seven batters he faced, but allowed a pair of two-run homers in the third. SoxProspects.com Director of Scouting Ian Cundall was in attendance at Hadlock Field, and observed that Owens lost his release point during that inning. Robby Scott picked up the win in relief, striking out three and allowing only one hit in 2 1/3 innings. and Miguel Celestino added an additional 1 2/3. Some stellar offensive performances overcame Owens' difficult start. Sean Coyle (pictured, above) had three hits including a two-run home run in the second. He stole a pair of bases and scored three times on the night. Mookie Betts has not let up since the season began - he has reached base in all 11 Portland games, and multiple times in all except one contest, earning honors as the Eastern League Player of the Week for his stellar play. On Tuesday he delivered his sixth double of the young season as part of a 2-for-5 effort. 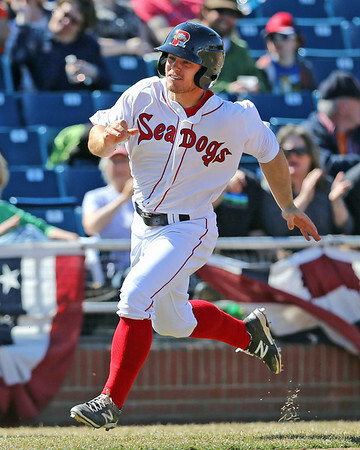 Peter Hissey also had a two-hit night for the Sea Dogs. After winning six of its first seven, Salem dropped its fourth in a row, falling 9-6 to the Myrtle Beach Pelicans (TEX) in morning action. Kyle Kraus struggled, giving five runs on eight hits in five frames. Madison Younginer could not stop the Pelicans attack, taking the loss in relief while allowing three runs in 2 2/3, walking three without recording a strikeout. At the plate, Kevin Heller continues to impress. The Amherst College product was 2 for 3 with a double and a pair of walks, and has reached safely in all eight games in which he has appeared. Jonathan Roof added three hits, included his fifth double of the year. Greenville saw its five-game winning streak halted in an 11-3 loss to the Charleston RiverDogs (NYY). Drive starter Cody Kukuk kept his Palmetto State rivals in check, allowing just one run on four hits in five innings, and walking just one while recording an impressive eight strikeouts. Kukuk turned the ball over in a 1-1 tie, but the bullpen could not keep the RiverDogs down. Jacob Dahlstrand took the loss, giving up seven runs in 2 1/3, as the 6-foot-5 righty fell to 1-1 on the season. Wendell Rijo was the star for Greenville. The night after hitting his first professional home run, the second baseman doubled and walked as part of a 2 for 3 night. Rijo has hit safely in five straight. Player of the Day: Sean Coyle is off to a solid start in 2014, and it is all the more impressive when considering he is also learning third base. With a logjam at second base due to the rapid ascent of Mookie Betts, Coyle worked out at third this spring and has seen action there in seven of Portland's first 11 games. The move hasn't had any negative effect on Coyle's bat, as he clubbed his second home run of the young season and stole a pair of bases in Portland's 9-4 win. Overall, Coyle is hitting .343/.410/.543 thus far.